V-brake or cantilever compatible. ***NOT FOR B+M OVAL Plus*** V-brake or cantilever brake (with spaceing adaptor) compatible. High quality CNC'd alloy headlight bracket, anodized black. 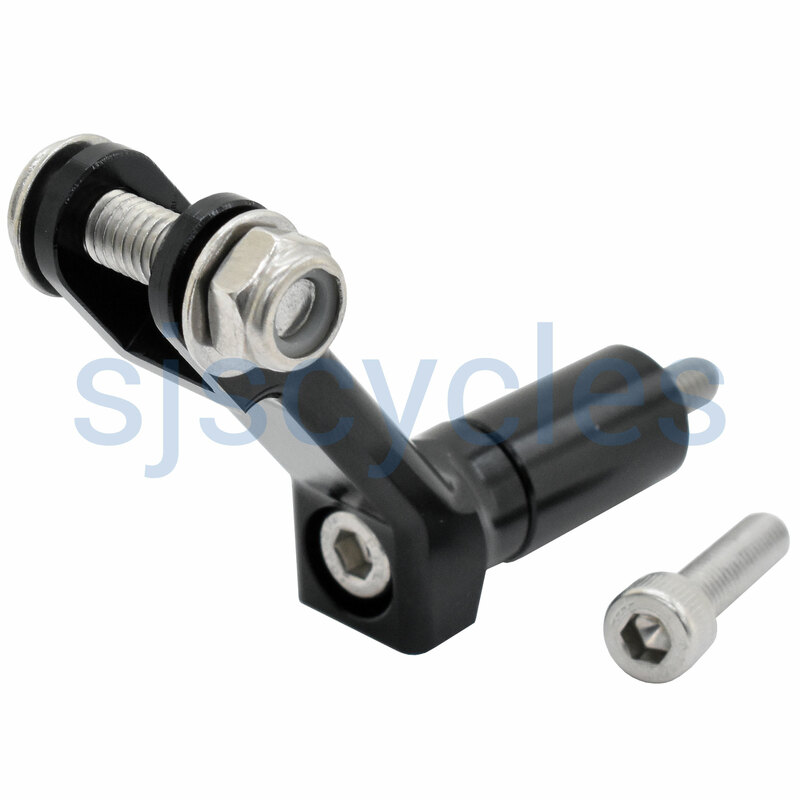 Includes: M5 x 20mm socket allen key bolt (for use with V-brake equipped cycles), M5 x 40mm socket allen key bolt and alloy spacer (for use with Cantilever equipped cycles), M6 x 25mm button head allen key bolt / 2 x M6 washers / 1 x M6 nylock nut (for headlight mounting). Unlike pressed steel headlight brackets this tough bracket will not fatigue and fail from road vibrations. Beautifully and simply made from solid aluminium alloy. Easy to fit and stale in use. A far better option than the bent wire or sheet material alternatives. This bracket is well made but unfortunately my Thorn Sherpa uses a M6 fork crown bolt and this is M5 compatible. My bad but because the rest of the bolts on my Sherpa are M5 I just assumed the fork crown would be the same. This is a solid bracket which replaced a factory bent steel bracket that broke on my Moulton TSR. The mounting hole needed to be expanded so the M6 Moulton bolt would fit. The bracket is very well made, however there are some minor gripes with it when using it with my Schmidt edelux and front reflector. You will need to file down the inside as its only wide enough to fit the light itself, so if you want the below light mounted front reflector you've got a lot of work ahead of you. This does show how sturdy it is that you cannot flex it enough to fit a thin sub 1mm bit of metal in beside the light mount. If you use this bracket on the fork crown with cantilever brakes you will also need to get a longer M5 mounting bolt, as the longer one supplied will only just fit through the front side of a hollow steel fork crown. Other than that its a great product, I only wish they made it in a polished silver version to match my edelux! Works, but I had to buy a longer (3 inches/80mm) M5 bolt to get through the spacer, the bracket and the fork bridge. Beautifully made, solid mount. Absolutely perfect to fit a Supernova E3 on a fork with cantilever brakes! This is so much better than the pressed steel equivalents. I needed a couple of washers to mount my Hope front lamp, and it needed an M5 instead of the supplied M6 Allen Bolt, but this is minor gripes. Yje bracket is rock solid and does not rattle against the mudguard like others I've had. Compared to sheetmetal brackets, this one is built like a hammer and will probably outlast the bike. Managed to fit a retro battery lamp to it by machining a brass spacer. Also had to lengthen the spacer tube on the straddle wire by about 10mm so that there's a clearance. No loss of braking as a result. Could I combine this with the business end (plastic bracket) of a cateye fork mount bracket? By removing the metal fork mount off the cateye mount? I hope that makes sense. No the spacing is too narrow on the Jtek mount. What Are The Dimensions Of The Bracket? What is the width between the brackets that the lamp mounts too? I looking too mount a GoPro fitting. This unfortunately would not be suitable for a Go-Pro fitting as the internal width is 9.5mm and the external width is 15mm. What'S The Thickness Of Light Unit That Can Fit Into The Bracket? The light fitting is standard 10mm, the same as used by most Dynamo lights like those from Schmidt, Busch and Muller as well as Supernova. I have one of these brackets on my Thorn Raven Tour and its excellent! Is it suitable to replace the Brompton front light fitting? Unfortunately you would not be able to fit this bracket to a Brompton. There is very little space on a Brompton for a front light bracket, this bracket would stop you fitting the brake properly, it's also unlikely it will clear the headset and even if it did it would raise the light up too much so would prevent the fitting of luggage and possibly interfere with the fold. The only suitable brackets are the ones marked up as Brompton specific. Hi, will this mount work with my Surly LHT with Cantilever Brakes? I am trying to mount a Busch and Muller Lumotec IQ Cyo RT. Thanks. This light mount should be fine for use on a Surly LHT fork and will be able to take that light fine as well. Is this mount suitable for use with the Busch & Muller 'Lumotec IQ2 Luxos U senso plus'? Although the fittings are the same it would depend on the amount of clearance you have as the B&M Luxos U is quite a large light. If clearance isn't going to be an issue then it will work fine.